Last month our very own Delta Force Paintball marshal Briony-Mai Reynolds was crowned Miss Cornwall 2015. You might remember reading about her in our Miss Cornwall news article. The multi-talented 19-year-old – who will represent Cornwall in the Miss England Finals next month – is now turning organiser, as she hosts a ‘Beauties vs. Beasts’ charity paintball match to raise money for Beauty with a Purpose – a non profit charity associated with Miss World. 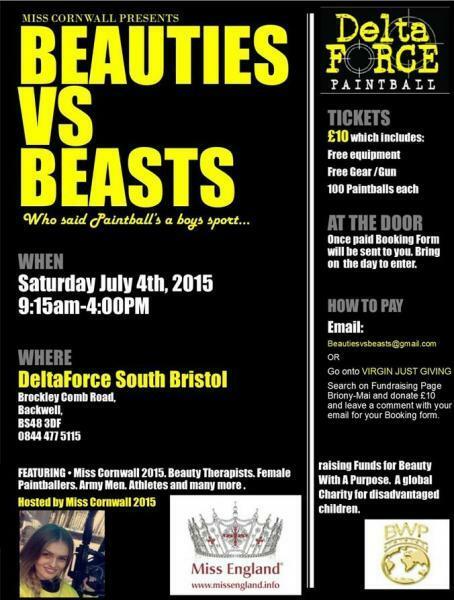 The event – to be held at the Delta Force South Bristol Paintball Centre on Saturday 4th July – will see Miss England finalists, beauty therapists and other female paintball players battle it out in Delta Force Paintball’s Hollywood inspired game zones against their male counterparts, including athletes and members of the British Army. If you would like to support Briony, feel free to visit her Just Giving page. With Hollywood inspired movie set game zones, state of the art paintball equipment and a five star safety record, Delta Force Paintball is the UK’s number one choice for paintball sports. Want to book your own paintball day? Why not call one of our friendly event coordinators 24/7 on 0203 869 9301? Alternatively you can visit our booking page to request a call back.